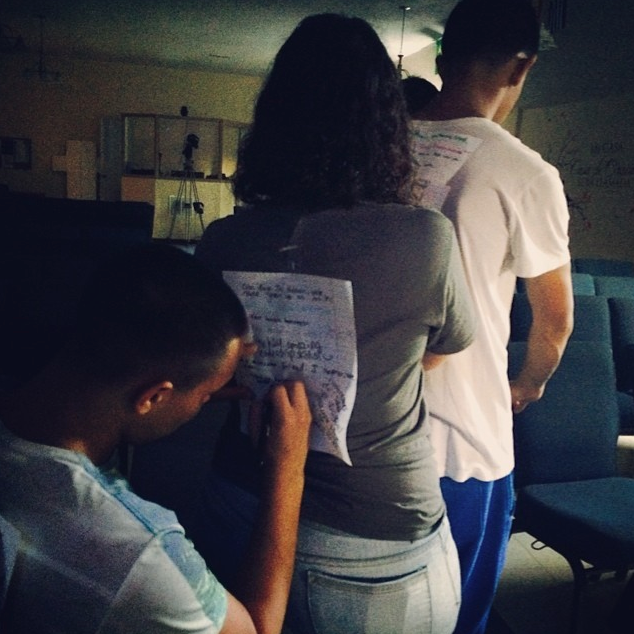 Last night at Unplugged we started with an activity that consisted of taping papers on our backs and writing nice fuzzy things to each others like “I like your smile”, “I love that you’re caring” or “your friendship makes me a better person”, etc. We had a lot of fun doing this and think that it is a nice way to demonstrate our love with each other in a different way. Sometimes we find a lot of “not-so-nice” things to say about people and we’re usually quick express it. I think there’s much room for improvement in our lives and I think one way we could start being better people is by thinking the best of someone (instead of the worst). As I think about the scriptures, I see that Jesus did indeed put a lot of focus on love and love for one another. John 13:34-35 “A new commandment I give to you, that you love one another: just as I have loved you, you also are to love one another. By this all people will know that you are my disciples, if you have love for one another.” It’s not easy sometimes to love people. Perhaps you’ve been hurt so much that you have no more love to give or maybe you’re so bitter from the struggles in your own life that you can’t imagine loving someone as God commands. But I challenge you today to say in your heart “I want that kind of love”. The love that binds everything together in perfect harmony. The love that breaks all barriers. The love that goes beyond the weaknesses of my brother and puts on love above all our past. That kind of love, is what I desire today for my life. There’s a lot of work to be done around the body of Christ, and one of the things that I realize in the church today is that we really need to love more. We must go out of our way to do things with love and to work restlessly at getting better at this. It all takes small steps to change a pattern and then to create a habit of seeing the BEST in people and LOVING them (even if they don’t love you). God’s love covers a multitude of sins, so if He sent His only Son to died for me, after all I’ve done to NOT deserve that, I think we can also follow His steps and learn to love people regardless of our differences. As I am writing this the Holy Spirit is also convicting me in my heart of people I should love more. Would you ask God right now to show you the people that He wants you to love more? Father I realize that I haven’t been loving people the way you want me to love them. I ask that you teach me to love others just like you loved me. You loved me so much that you sent your one and only Son to die on the cross for a sinner like me. I pray that I may have the kind of love that is willing to put differences aside. I ask that your love may overflow in my life in such a way that I see the best in people. Teach me to express your love to others and let me forgive those who have wronged me just like you have forgiven me. In Jesus Name, Amen.